Binary options trading employs a number of strategies that all incorporate a number of indicators and factors including market sentiment. Many strategies work for new traders, while some strategies are refined by those who have been trading longer. In essence, the binary options trader must learn to be comfortable with the strategy that they are using. Traders must be aware of the risks and returns when using a certain strategy. One common strategy that is very popular among both novice and professional traders is the straddle strategy. The straddle strategy is an options strategy wherein the investor holds a position in both a call and put with the same strike price and expiration date. The straddle strategy is a neutral options strategy. This means that the straddle strategy is an options trading strategy that is employed when the options trader does not know whether the underlying stock price will rise or fall. Because the straddle strategy is only a good strategy to pursue if a trader believes that a stock’s price will move significantly, but is unsure as to which direction, the stock price must move significantly if the investor is to make a profit. It should be noted that there is extreme risk to using this strategy because only a small movement in price occurring in either direction will mean a loss for the investor. For stocks that are expected to perform significant jumps, the market tends to price options at a higher premium, which ultimately reduces the expected payoff should the stock move significantly. The straddle strategy is accomplished by holding an equal number of puts and calls with the same strike price and expiration dates. The following are the two types of straddle positions. Long Straddle Strategy — The long straddle strategy is the purchase of a put and a call at the exact same strike price and expiration date. Increased volatility of an asset that changes the market price motivates binary options traders to use the long straddle strategy. It is meant to take advantage of this trait regardless of which direction the market’s price moves. The long straddle position will have you positioned to take advantage of the movement. Short Straddle — The short straddle strategy requires the trader to sell both a put and a call option at the same strike price and expiration date. Conversely, traders take advantage of a market price with little or no volatility. By selling the options, a trader is able to collect the premium as a profit. Profits will be purely based on the market’s inability to move up or down. If the market develops a significant bias either up or down, then the strategy fails to deliver significant profit. Because binary options trading only allows traders to buy call or put options, the long straddle strategy is commonly used by binary options traders. When using the long straddle strategy, the binary options trader is looking for a significant move; either up or down in the underlying stock before expiration. This market neutral strategy is specifically designed for high volatility conditions where stocks are swinging wildly back and forth. As long as the asset price moves and does not stay in a stagnant position, this strategy is best to use. Setting up a straddle position to use the strategy employs two long options put together. Any asset can be used with the same strike price and the same expiration period. To set it up, the binary options trader simply buys a call option and a put option with the same strike prices with the same expiry time. The binary options trader can slide the purchases up and down but most strategies are centered around ITM options because the trader does not care which direction it goes as long as it moves. 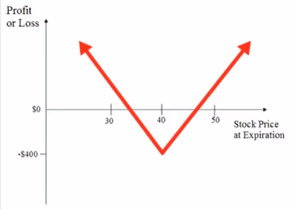 The maximum loss occurs if the underlying stock remains between the strike prices until expiration. If at expiration, the stock’s price is between the strikes, both options will expire worthless and the entire premium paid would have been lost. The maximum gain for the long straddle strategy is theoretically unlimited. This occurs if the underlying stock keeps going up, and also would show a very substantial gain if the stock becomes worthless. The net profit is calculated as the gross profit less the premium paid for the options. Since the binary options trader wants a big move in either direction, an increase in implied volatility would have a very positive impact on this strategy. Even if the stock price holds steady, a quick rise in volatility would push up the value of both options and might allow the trader to close out the position for a profit well before expiration. A decreased volatility will not help the trader’s position. The passage of time has a negative impact on this strategy. Options with a finite life need to move quickly or risk becoming worthless. Because the strategy consists of two long options, every day that passes without a move in the stock’s price will cause their value to suffer a significant decrease in value. If the stock price is trading at $40, we are going to buy 1 40 CALL for $200 and buy 1 40 PUT for another $200. This sums up to a total of $400 debit on the trade. The maximum loss for this setup is $400, or the cost of the trades. This is again when the price closes right at the strike price which is at $40. The maximum profit is unlimited, again because there is no range bound on the price level either moving up or down. On the outside this strategy looks like an easy winner. Use the straddle strategy during low-to-high volatility instead of during periods of already high volatility. Also, look to close out the position early if you get a quick move in implied volatility without any movement in the underlying stock. But, using the straddle strategy can only be executed properly when traditional options or advanced binary options trading platforms implement and support ‘pending orders’, also called Knock-in trades. A pending order allows the binary options trader to execute trades once price touches preselected values. We have a list of binary options brokers. You could go through them to check out which broker would be best for you.